I'm going to let you in on a dirty little secret - I don't really love chocolate. *gasp* When my girlfriend Diana first shared these with me, I politely accepted and was pleasantly surprised! 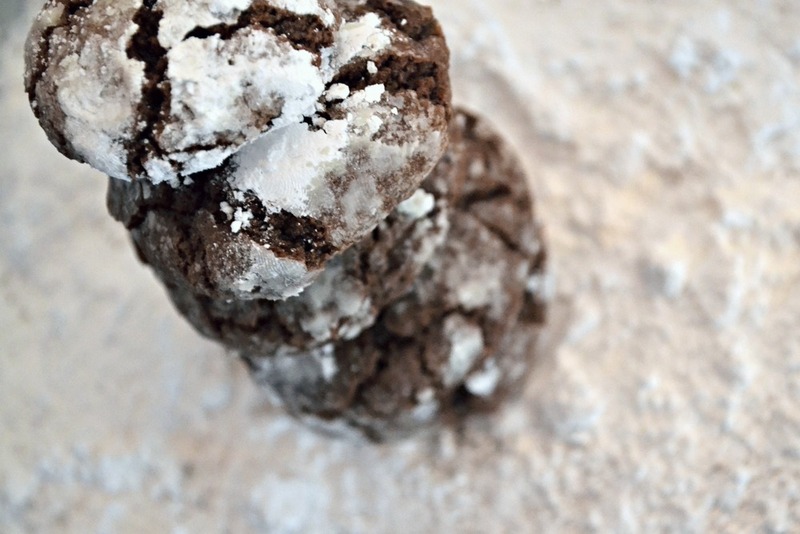 Theses cookies tastes like yummy little chocolate cakes and I love anything covered in powdered sugar. I text her yesterday for the recipe when I needed any easy dessert to share for family dinner. I shouldn't have baked them so early in the day though. It was difficult not to nibble away all day and save them for our guests. Be sure an adult is nearby to help.Preheat an oven to 350°F. Grease 2 baking sheets with butter. Mix the ingredients In another bowl, using a wooden spoon, stir together the flour, cocoa, baking powder and salt. Set aside. In a large bowl, using an electric mixer, beat the butter and sugar on medium speed until creamy, about 3 minutes. Turn off the mixer and scrape down the bowl with a rubber spatula. Add 1 egg and beat on medium speed until blended. Add the other egg and vanilla and beat until blended. Form the cookies Using a tablespoon, scoop up a rounded spoonful of dough. Scrape the dough off the spoon into the palm of your other hand. Roll the dough into a ball. Roll the ball in the confectioners' sugar until covered. Place the balls on a prepared baking sheet. Repeat, spacing the balls about 2 inches apart. Bake the cookies When 1 baking sheet is full, put it in the oven and bake the cookies until they are crackled and puffed, 10 to 12 minutes. Using oven mitts, remove the baking sheet from the oven and set it on a wire rack for 15 minutes. Using a metal spatula, move the cookies onto the rack and let cool completely. Repeat with the rest of the cookies.